The past few days we have been staying at Broadbeach on the Gold Coast. 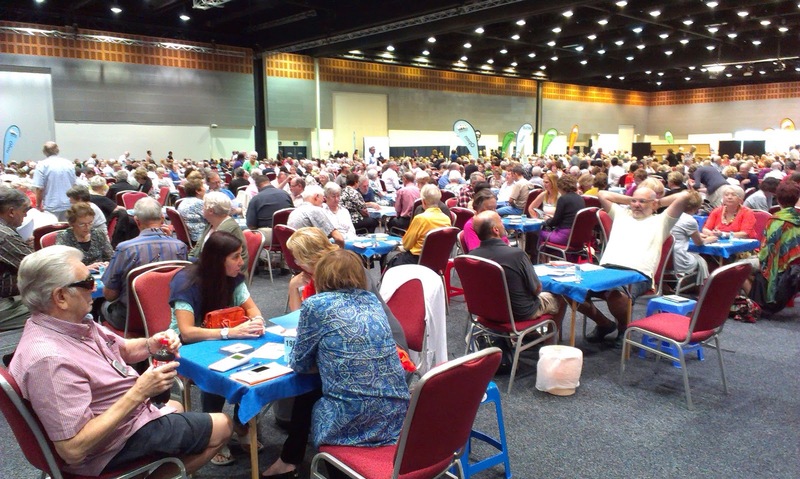 We come up each year at this time to play in the Gold Coast Bridge Congress, organised by the Queensland Bridge Federation, which is one of the largest, if not the largest congress of its kind held in Australia. This year is the 52nd anniversary of the event. We are playing in the 3 day Open Teams event at present - there are about 420 teams playing concurrently in the Open, Seniors & Restricted events. That translates to about 1000 players in one event, and there are quite a few other events over the period as well. We are staying at the Meriton Apartments (find out more about it here). They are reasonable, very comfortable and close to the shops, beach & Convention Centre were the bridge is held. We have stayed here now about 5 years, and it is beginning to feel like a home away from home. And the view from our room early yesterday morning. The clouds were stormy and threatening, but there was a ray of sunshine way out on the horizon which was glittering on the surface of the water. I took the photos from our balcony. I freak out a bit about the height, although I'm sure its perfectly safe. I just can't lean over to look down! The weather is often pretty terrible at the end of February, and this time it is no exception. There have been several bad storms in the area, with huge tides, over the last few weeks and the beach here is totally washed away. The viewing platforms have been cordoned off because they are hanging over thin air, with the beach underneath all gone. At least this year we have managed to dodge the showers of rain on our way to and from the Convention Centre, and there have even been one or two bursts of sunshine, albeit very brief. Not beach weather at all, so its just as well each day is taken up with bridge. Our time here is often very social. We catch up with interstate friends, and those from Sydney too. Although the apartment is self catering, you don't really cook, so lots of dinners out with friends and takeaways at home as well. This year I caught up with my best friend from Years 7 & 8. We don't see each other often as I moved to another school in Year 9, and then Kerrie moved out of Sydney when she left school, teaching in lots of country towns. It never ceases to amaze me how one reconnects with a friend from the distant past, and you just take up where you left off. Obviously, the things which attract people to one another in a true friendship continue to attract through the years. Love it! Of course there are people I have associated with over the years, who have just filled a need at the time. These aren't lasting relationships and when I bump into them many years later, I wonder at what it was I saw in them in the first place. Time to head for the bridge table! Its finished!! What do you think? It has been raining steadily for the last couple of days, so unfortunately I had to take the photo anyway, as the quilt had to be posted. The colours have not come out well in the photos. Boo, hiss. The yellows are gorgeous vibrant colours, & the strips on the two long sides have a black & white Celtic knot on them. 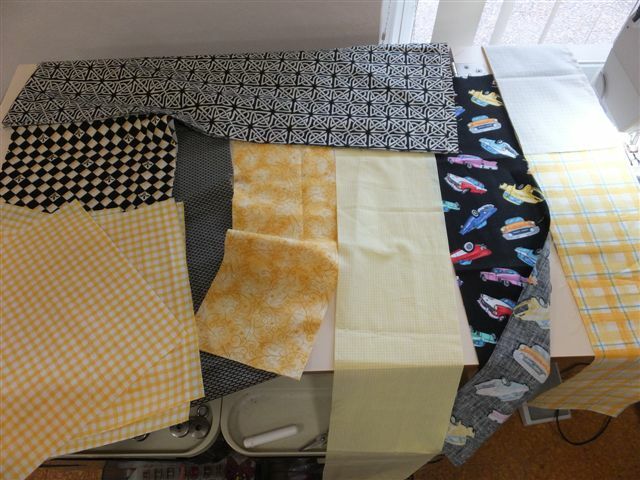 The middle strip is black & yellow squares with a trefoil in some of them - you can see some of these in the photo below. 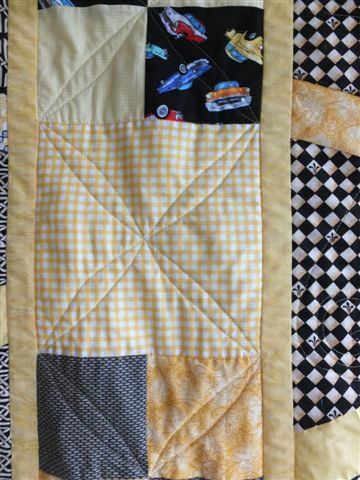 Some of the 4 patches are made from a fat quarter I found with vintage cars on them (think they are Cadillacs but I am probably wrong). 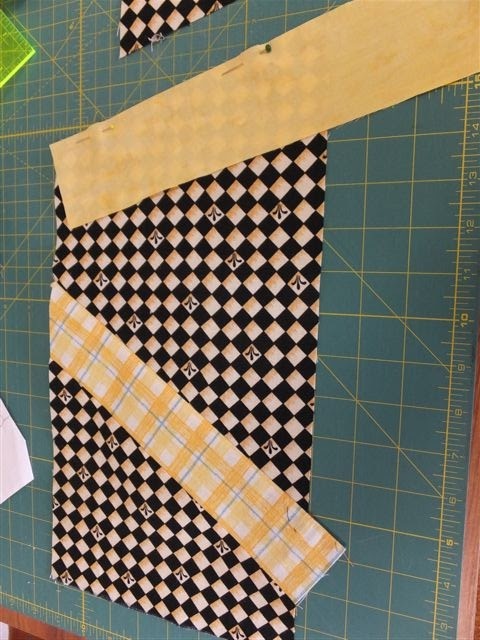 I stabilized the quilt by quilting in the ditch on either side of the narrow yellow strips and also between each of the checked squares & four patches. I then free motion quilted each of the squares in the four patches ﻿ from corner to corner in a lozenge shape, and carried the same design through to the checked squares. 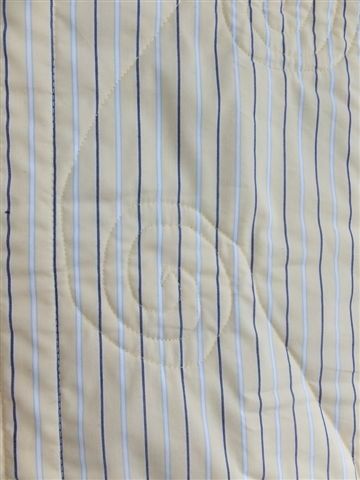 The two side strips & the middle one, I quilted with spirals which you can see fairly clearly on the back of the quilt. I should probably have put more quilting into it, but we are off tomorrow for a week in Queensland, and I was too pressed for time. It was posted this morning to an Aussie Hero in Afghanistan. Yep. I did say this morning. We are particularly fortunate in having two post offices within a few kilometres, both of which are open on Saturdays. I can't remember seeing a post office in Sydney open on a Saturday since some time in the 1970's. Who said we in the Country are behind the times! 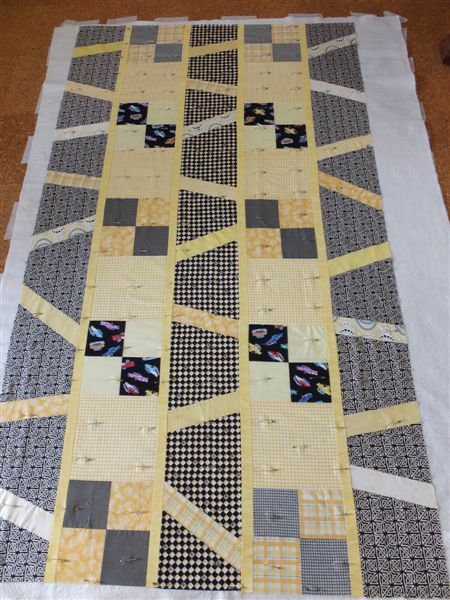 Well more time has passed than I would have liked to have done, but I am finally at the stage of pin basting my black & yellow quilt. So many things have got in the way of sewing lately, I have begun to wonder if my machine will know me when I sit down to it to do the quilting on this project. One thing that happened was that I was summonsed to be on a jury panel last week. I turned up as there is a hefty fine if you don't, but it was a horrid case, and I am just so grateful that I was not selected on the panel. Even though I lost a day fiddling around with that, I don't care. I wasn't selected, and that is what counts. I am very pleased with how the quilt has turned out. It is always a bit stressful when the idea is there, and the planning happens, then you begin to sew, and it is only when you are so far through the sewing stage that it is not worth turning back that you can tell what it will look like. 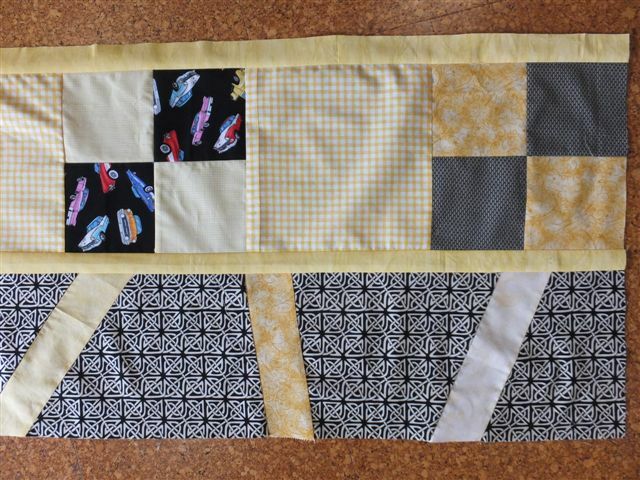 Its﻿ to be an Aussie Hero quilt, and the chap did ask for black & yellow, so I do hope that he likes it. I do. What do you think? I don't quite know what went wrong, but my measurements must have been out. Both the batting and the backing were not long enough for the length of the quilt, although they should have been. So it was a bit of a squeeze to get the quilt to fit. Never mind, I have it pinned. 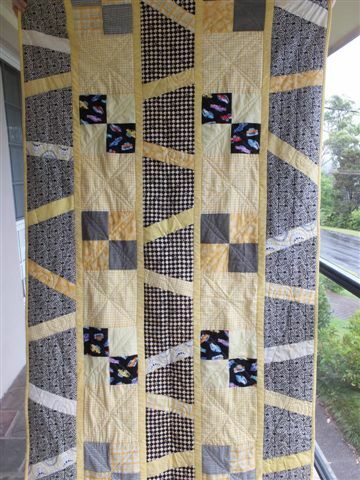 A couple of weeks ago Jan-Maree asked me to do a black and yellow quilt to fill one of the requests she has had for Aussie Heroes. I remembered sorting a bunch of black and white fabrics and putting them all together into one bag, so I happily agreed to do one. Getting home I looked for this bag, and of course could not find it. I am still at a bit of a loss as to what has happened to it, but as I have had a couple of people coming by and raiding my charity stash, perhaps that was one of the things taken. Who knows. So the next time I went to Stitching Hearts, I raided the cupboard for some fabrics, and with what I had at home, I managed to put together a reasonable pile. There is also a fat quarter of black fabric in this pile on the right, with old fashioned cars printed on it, which I think is just so cool. I bought that at Craft Depot. By this time, my mind had been working overtime on what I would do for a design. As its for Aussie Heroes it needs to masculine, fairly simple, and a bit of a strange size. It needs to fit an Army cot and be long enough for a tall fella. I decided to do three rows of fabric, slashed at irregular angles and directions, at irregular intervals. There are various yellow fabrics inserted in the slashes. 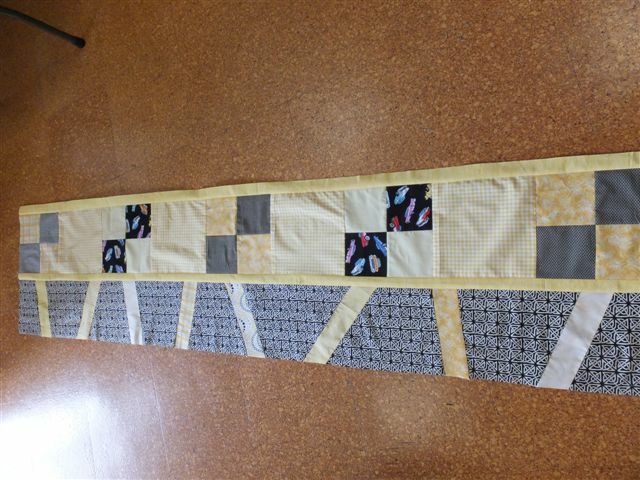 Between each of these three rows there is a row of black and yellow 4 patch blocks. And the detail. 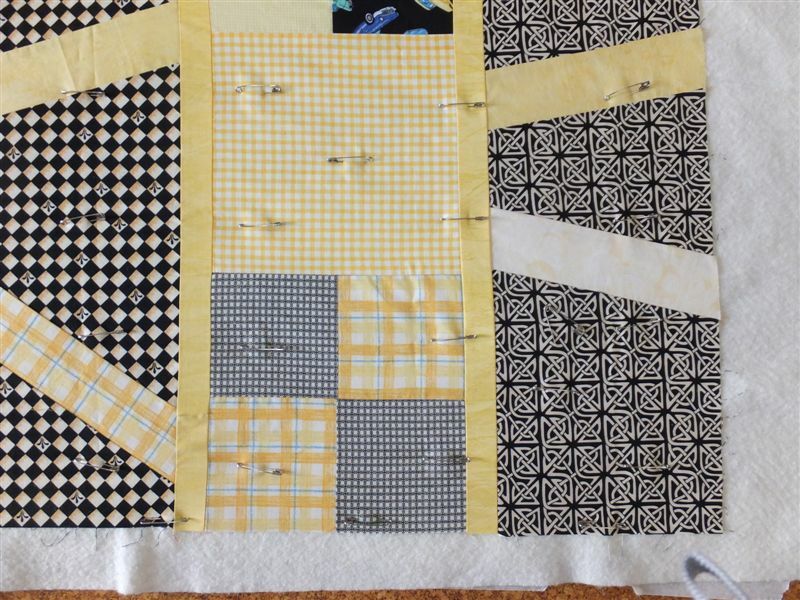 You can see the 4 patches have a plain yellow and white gingham block separating each block and there is a 1 inch strip of plain yellow on either side of the 4 patch row. This particular piece of black & white has a Celtic knot﻿ design printed on it. I didn't have enough of this fabric to have 3 strips the length I wanted, so the middle one is going to be a bit different. The tricky bit was the slashing to insert the strips. For some reason the photo has upload sideways, and I can't rotate it. I tried to rotate it on my computer and then upload, but that didn't work either. After inserting the yellow strip, you need to trim it down to size to match the row edges, making sure that you keep the width of the row itself true. The photo above shows a piece I have inserted on the left waiting to be trimmed, and the piece on the right is ready to sew. I had originally intended to stack the three strips on the board and slash them through concurrently, but then I thought better of it, and did them individually. I am glad I did, as its not as easy as it sounds - you need to offset the strips in the same way as you do triangles, and also the bias edge on the black fabric is stretchy, so you need to take care. I had to unpick more than one seam!